Efficacy of Homoeopathy can be lime lighted to the world only by treating challenging cases. Here Dr.R.Gnanasambandam, President, Tamil Nadu Homoeopathy Medical council, Member, DTAD, Department of AYUSH illustrate with a case of Fertility in varicocele... scope and successful treatment. A male aged 39 years, who is longing for a child since three years consulted me for low sperm count with bilateral varicocele. After one year of married life the couple underwent routine check up. 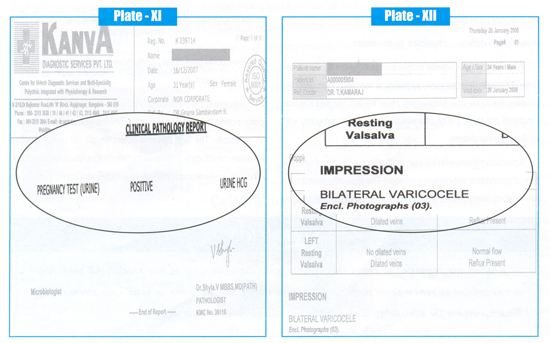 Male partner was reported after screening oligospermic with bilateral varicocele (Plate I and Plate II).The female partner was normal. Initially he tried all sorts of medicine and finally opted homoeopathic treatment..
· Sweat in armpits, sleep disturbede. The constitutional drug Lycopodium has not given desired result in this case, the second prescription, antimiasmatic drug Nitric Acid has removed the block. Damiana Q is administered on organ affinity and could have acted as a catalyst. A male aged 39 years, who is longing for a child since three years consulted me for low sperm count with bilateral varicocele. 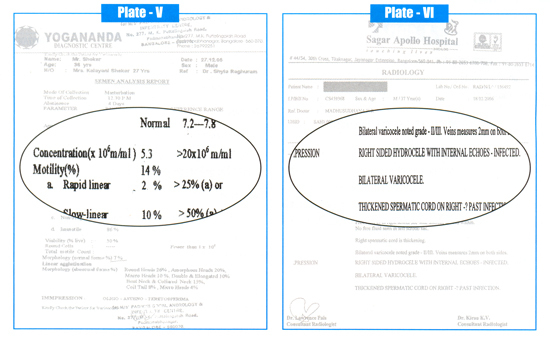 He narrated that after one year of married life the couple underwent routine check up, seminal count was 5.3 Millions with 14% motility (Plate V). The scrotal doppler reported that right sided hydrocele, with internal infection, Bilateral varicocele and thickened spermatic cord revealing past infection. (PlateVl). He was advised to undergo surgery. General examination was carried out for the surgical fitness which stated that there was elevation in blood pressure 180/120 mm of hg and the Echo cardiogram gave the impression as mild left ventricular hypertrophy (PlateVII). An Urologist took care of him and he suspected some internal pathology connecting the left ventricular hypertrophy and varicocele. 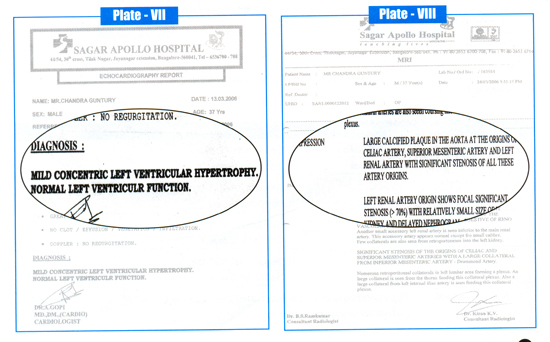 He directed him to undergo a Renal doppler which stated as bilateral renal artery stenosis more significant of left side. MRI angiography was carried out for further probing which stated that the abdominal arterial system was disorganized and distorted. There are calcification and stenosis found in coeliac artery, renal artery and superior mesentric artery. With few anastomozing branches also recognized (Plate VIII). To proceed further Renal Angiogram was carried out which illustrated as left kidney is perfused and contracted. 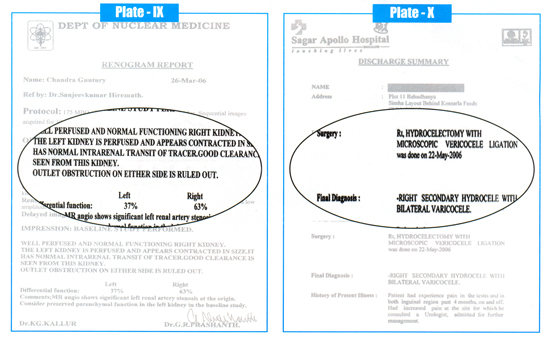 The left kidney was functioning 37% and the right kidney as 63% (Plate IX). 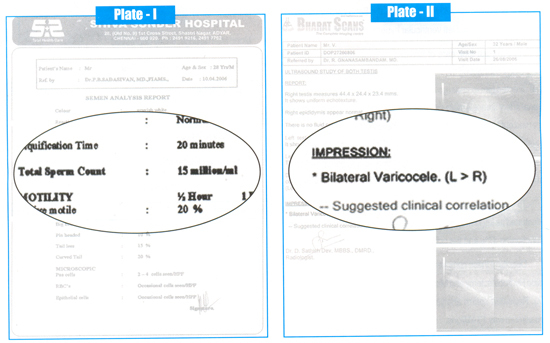 Despite of these complaints hurted the patient a lot underwent Right side Hydrocelectomy and Microscopic varicocele ligation in 2006 (Plate X). Repeated sperm analysis had shown ups and downs and the maximum was 13 Millions. Then they tried natural way and then tried initially with IUI, then IVF in a fertility center, then finally the doctors advised him to go for adoption. He was much desperate and depressed which was required him to a psychiatric consultation. He also advised him to adopt a child. 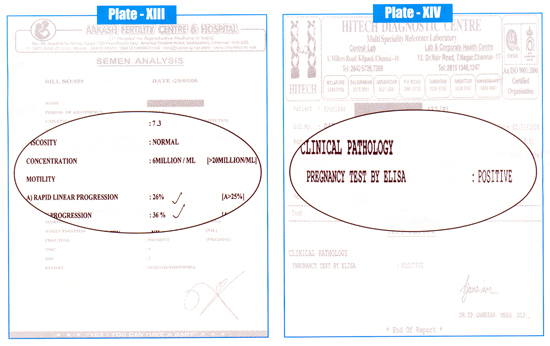 Advised pregnancy test, when his partner skipped her periods, the Gravindex was positive (Plate XI) Antenatal care was taken in a maternity home and after 10 months delivered a female baby. Nux Vomica was prescribed based on the constitution of the patient, which had centrifugal action. Haemamelis Q is prescribed to expedite cure on similimum basis and the remedy has affinity over the capillary system so it is called as “Aconite of the capillary system” . Varicocele is the most common cause for male infertility. About 30% of the male patients suffer from this surgical classification of disease. This could be an incidental finding in majority of males who under go for routine tests for infertility. Varicocele may give raise serious of complication in sperm production. The pooled blood in the pampiniform plexus indirectly raise the temperature in the scrotum, impair assimilation of nutrients for spermatogenesis. A varicocele patient may suffer from oligospermia and morbid morphological changes in sperm azoospermia also results in few cases pain in the scrotum or dragging sensation is not experienced in many varicocele patients. Even though a physician can diagnose by visual examination and palpating “Bag of worms”. 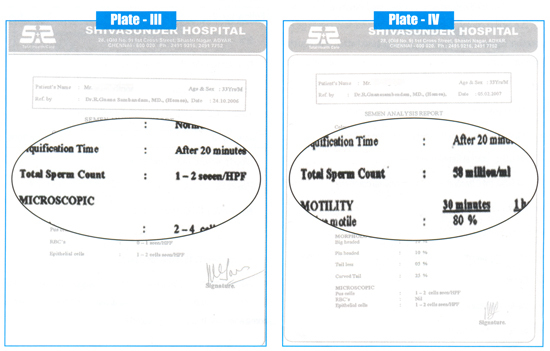 It is always better to go with a doppler study, when a seminal analysis reports, low sperm count or absence of sperms. Today the most preferable option to this problem is surgery. At the outset, the fertility rate is poor after surgery and also opinioned that the individual may suffer from Antisperm Antibodies. Many victims suffer from psychological problems and reciprocally erectile dysfunction may result. Permanent infertility may result. The polycrest prescribed based on key note symptoms has given minimum result. The key note is “Increased desire, but physically impotent” has given improvement in this case. While handling an infertile couple our ultimate aim is make them fertile. Of course there are many pathological conditions that prevail the infertility would be time consuming. Here we are focused towards functional activity of the organs which can be better remedied with similimum in many cases. A physician shall prefer his own methods on selection of remedy, plan of prescription without any confusion. The above illustrated case has received different types of prescription which could appear different modes of approach to many physicians like blind man describing an elephant. A varicocele patient may prefer homoeopathic treatment with or without surgical option. Prime aim in this condition is to enhance the sperm count, increase sperm motility, restore the abnormalities of the sperm and make him fit to the occasion. The high dynamic potencies will act on the disease dynamism centrifugally. The use of mother tinctures prescribed on organ affinity will accelerate cure, benefit, save money and time of a varicocele patient.